After two nights in Santiago, Steve saw me off on my way to Finisterre ( or Fisterra in the local Galician ) where, according to medieval legend, St James’ disciples requested the Roman legate for permission to bury the apostle’s body. And so, for the first time on my own in this journey, I started with my walking meditation. It is surprising, I was thinking, how accustomed one becomes to walking for hours on end each day. Some small adjustments to the weight load and clothing after day three and, from there on, thirty plus kilometres a day seemed perfectly normal. I stopped at one point by a ( another ) Roman bridge for a few nuts and figs I was carrying and offered to take some photos for a group of French people. 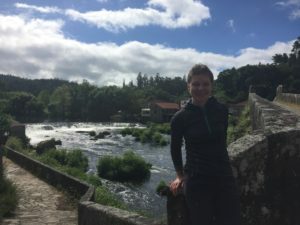 I missed Steve when they kindly reciprocated to take one of me on my own – not something I would normally do, but then, odd things happen on the Camino. I arrived at Negreira, my intended destination for the night, just before midday. Hesitating about what to do next, I felt it was too early in the day to stop, I was suddenly greeted by a guten morgen. And so I met Thomas and Juan, a German and Spanish pair just them emerging for the day after a night of football celebrations. We set off together for lunch then 15km to end up in Vilaserio, happily chatting as if we were long lost friends. And just as we entered our chosen albergue for the night, we bumped into Ralph from the Netherlands, another fellow peregrino with whom Steve and I had been intermittently walking from Porto to Santiago. An opportune moment at the albergue arrived for me to provide more insights into the world of breathing, Juan and Ralph were eager students; the snoring of other fellow peregrinos in the dormitory later made me realise that there was much work which could be done in this ( honestly ) fascinating field. I was luckier the next night at Logoso where I shared a room with just three lovely ladies from the US. 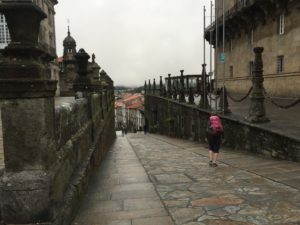 And so the final day of my first Camino adventure arrived. I set off on my own at 7 a.m. after the usual meditation and breathing practices. 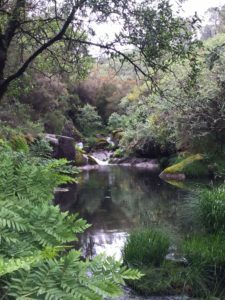 My thoughts that day returned to the previous evening, when Thomas had decided to bare all in a fresh water pool we had come upon – as I said, odd, but strangely normal-seeming events, happen on the Camino. By chance Ralph and I met up later in the day and decided to walk the last 15 km together, sharing some of our various experiences, both of us at interesting crossroads in our lives. Both uncertain, but positive about what next. Not so many peregrinos make the roughly 100 km trip to the end of the world, a pity for them, but it makes it a peaceful journey for those who do. We met a Dutch couple who had made Finisterre their home and we were glad of their recommendation to stay at Sol y Luna, a lovely small albergue with a meditation room. 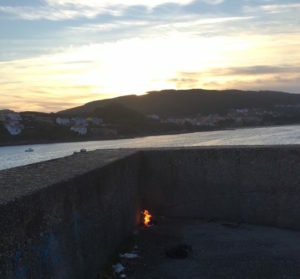 Booked in for the night, as tradition has it, Ralph and I went off to burn a small item of clothing each, along with some pieces he was carrying for three Portuguese ladies who couldn’t make it. This entry was posted in barbarapi, From a Foreign Field and tagged barbarapi, Foreign field by barbarapi. Bookmark the permalink.